On Tuesday, MGoBlog picture paged some of Michigan's more perplexing "read option" plays. The second of the two plays Brian examined highlighted something that I noticed a number of times throughout the game: Alabama was blitzing its boundary corner all game on run plays, leaving Michigan's outside receivers a) one-on-one with safeties and b) wide open approximately 5 yards downfield. Even when they weren't explicitly blitzing, Bama's corners were often in zone coverage and selling out against the run as we'll see below. In this situation, Michigan is in 2nd and 2 in the first quarter. 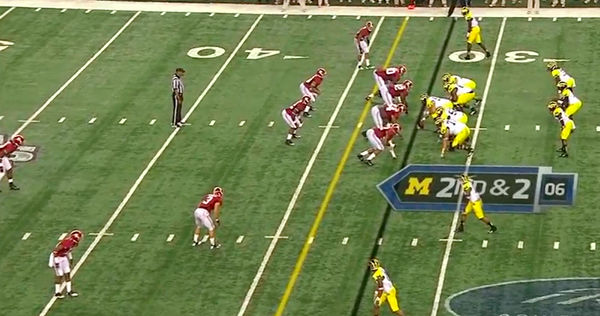 Michigan is in a three-wide, two-back set. 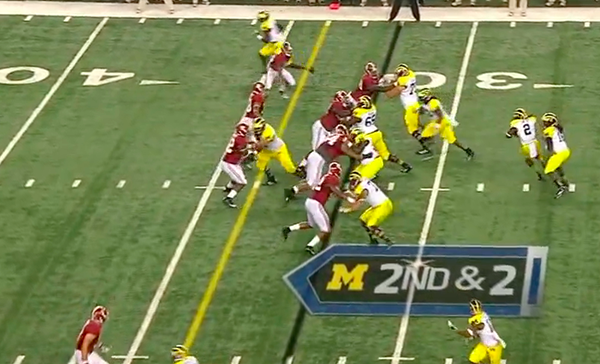 Devin Gardner is isolated on the weakside of the play (top of the screen). In this screen, Alabama only has 10 defenders, meaning their free safety (off the screen) is at least 10-15 yards downfield. As the ball is snapped, Gardner takes off downfield. 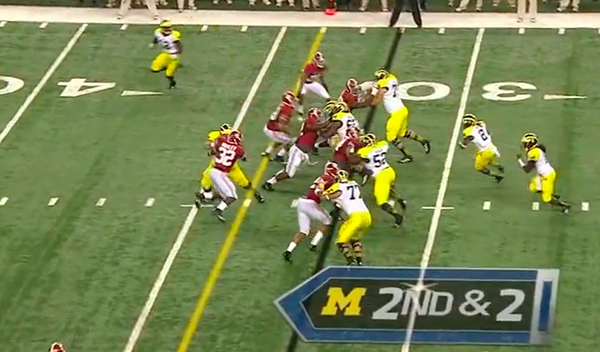 You can see the corner over Gardner is staring into the backfield. Alabama's corner almost completely ignores Garnder, and as the ball is handed off, Gardner is streaking past the corner into wide open space (about which more later). Gardner: open. Vincent Smith running into a wall of players no back in the NCAA could make it through. The play ends like this. This is how Rich Rodriguez's QB Oh Noes worked. As defensive backs stared into the backfield, Michigan's receivers ran by them into open space for long, uncontested touchdowns. The problem here is that those plays (or reads, whatever they were) have been completely removed form the offense. 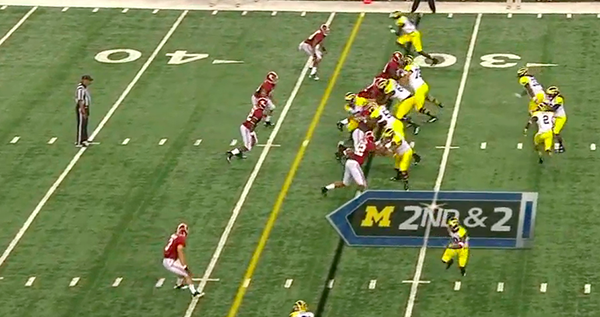 ...Devin Gardner appears to have no intention to block his cornerback. That means one of two things: either Gardner is supposed to run a route here that Denard has been instructed to read, or Garnder just refuses/is unable to block. My guess is the latter. All of Michigan's other receivers on these plays engage their defensive counterparts and more importantly, Denard never looks toward Gardner running downfield. If he did, it would be an easy completion and run after the catch. The chances of any other team's corners being this aggressive this year is unlikely, but if they do use these plays to gameplan, I hope Borges will take note of how wide open his receivers are. There are more than two options (and unfortunately, the one you're omitting is the correct answer). Gardner's assignment is to run his defensive back out of the play, so the guy won't be in position to make a tackle until downfield. That's a pretty common assignment for playside receivers (on the backside, you want the DBs to stay close to the line of scrimmage so they won't be in position to make a downfield tackle, hence the different assignment for those guys). The problem is that Gardner's defensive back wasn't in man coverage, so it was sort of a "paper v. scissors" situation. Saban's Alabama is pretty well-known for blitzing their boundary corner, so the adjustment should have been made from Borges' end to either exploit that tendency or simply have Gardner block instead of the traditional assignment on that play. It appeared to me that Denard was either mis-reading the "read-option" or they were strictly desinged handoffs with a read-option Look--a fake read-option if you will. Also, I agree that QB oh noes would have been great in this game, but that play is non-existent in Borges' O. I think Devin is intending to "run his CB off" out of the play, but clearly it isn't working. Notice though that Gallon is bubbling out on these plays. Also of note, Borges said in the presser that the gameplan was to run into a "soft box" and there are only 6 men in the box on these plays (7 if you count the crashing CB.) So, these plays are "run" all the way--it doesn't make sense to me to give a "pass" look with CB run-offs and bubbles if this is a designed run though.